Guys. I have to tell you, I am so so very excited to share this post with you all. While many of you know that I’m on my own pregnancy journey, and some of my posts will likely reflect that once I’m back up and going, long before I knew I was pregnant, I knew what I wanted this time around: a fit pregnancy. While my new goal is simply a healthy one, someone very close to me, my sister-in-law, got to accomplish just that. I’d done tons of research on the perks of exercising, even strenuously, during pregnancy, and had read tons of success stories. However, I hadn’t been close to anyone who’d made it happen. So, I was excited to hear her take and to encourage her through her exciting journey! What I didn’t expect, is what she encountered during that time. I think that what she put together here is an interesting read that we should all take to heart, whether we’re going for it or not. 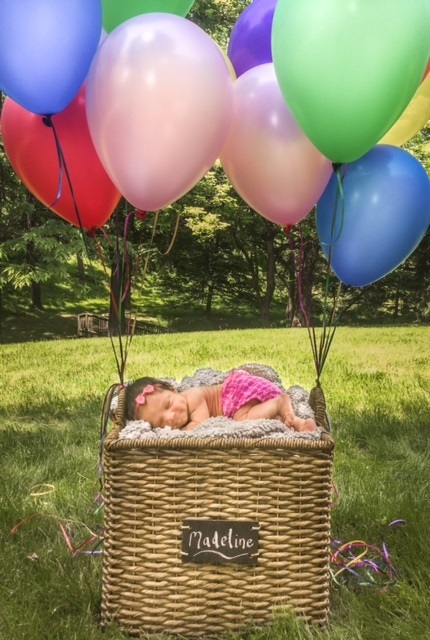 I’m not going to divulge more…she does it perfectly…but I did want to share a picture of my new niece for everyone to enjoy before jumping in! Read what Jen has to share, think about how you can relate – from the inside or outside – and share your thoughts! “You’re still teaching at the gym?! I stopped doing cardio when I found out I was pregnant because I wanted to keep my baby”. This isn’t something I expected to hear at 20 weeks pregnant. Let me preface this little rant by saying that I have always been athletic. I grew up playing field hockey, basketball, and swimming. I continued playing field hockey throughout college, and afterwards I picked up running to clear my head and keep me in shape. I have two half marathons and a full under my belt. I’ve conquered a few “Tough Mudders”, and in the last 2 years I started teaching INSANITY at my local gyms. The point is, I’ve never been what you would call a “couch potato” and I have been blessed with good health thus far in my life. Before trying to get pregnant, my fitness routine mostly consisted of weight lifting 5 days a week and teaching 2-5 INSANITY classes. I have always loved fitness because it makes me happy. It clears my mind. After my husband and I decided to try to get pregnant, we discussed that having a healthy baby was our top priority. My first stop was the OBGYN to have a check-up and ask if it was safe to continue this lifestyle while trying to conceive, and throughout pregnancy. His answer? “Keep doing what you’ve been doing and listen to your body”. Awesome. A healthy baby and healthy mom were two goals that seemed to go hand-in-hand. And so, the day I found out I was pregnant I resolved to continue to work out as best I could. I would not push myself farther than my body wanted to go, and I would always listen to the little one growing inside of me. I promised myself I would stop immediately if anything felt “off”. Nothing was worth sacrificing the well-being of my child. The first time I really began to understand the dynamic of a “fit pregnancy” was at 6 weeks pregnant. Months before this, I had signed up to complete a 3-day, 60-mile walk for the Susan G. Komen Foundation. After months of fundraising and training, this was something I felt very strongly about completing. This was going to be an enormous challenge for me but I vowed to take it step by step, both literally and figuratively. I completed all 60 miles of the walk, and while I felt a huge sense of accomplishment physically, what I learned during those 3 days was far more important. I began to understand that it was okay to take things slowly. I never for one second felt unwell during those 3 days (ya know, besides my knees and feet feeling like they were going to fall off but that’s pretty typical from what I’ve gathered). Even at 6 weeks, the baby needed me to rest a little more often and to always have snacks and water on hand. After the walk, my husband and I thought that learning to make these small changes would be one of the toughest challenges I would have to face in pregnancy. But then I told people I was pregnant. Sharing the best news of our lives with loved ones was full of congratulatory excitement, but it wasn’t long before the criticism began to take shape. We announced our pregnancy at about 12 weeks. The first comment I seemed to get after telling someone the news was disbelief that I was going to continue teaching INSANITY. It was funny to me that people with no medical background would argue that it wasn’t safe, despite the fact that I had cleared it with my Doctor and that I myself have significant medical knowledge. As I continued to safely maintain my fitness routine throughout my pregnancy, the criticism seemed to gain momentum. My response to all comments was simply a smile. But inside I was fuming. As I ate my usual salad for lunch, “Salad again huh? Don’t you know you’re supposed to enjoy your pregnancy?”. Actually, I was enjoying it, until you opened your mouth. After someone asked me if I was wearing maternity pants at 5 months pregnant and I said no; “You’re working out too much. That poor baby has no room to grow”. My Doctor says I’m measuring right on track, thanks. At 6 months pregnant a student of mine at the gym asked how far along I was. Once I told her, she answered with a long stare and asked “Do you even eat? !” I didn’t even have a response for that. Sometimes the critiques were mildly veiled with concern. “What does the Doctor say about your weight gain? Is the baby getting enough food?” Again, measuring right on track. The comment with which I began this article was perhaps the most hurtful I heard during my pregnancy. The implication that I cared more about fitness than the possibility of a miscarriage was beyond insulting. I can remember staring at this person with my mouth open wide, and promptly going to the bathroom to cry. It may be important to note that 99% of the negative comments were made by other women – many of whom were already mothers or were pregnant at the time. I’m guessing that for most of you reading this, that doesn’t come as much of a surprise. 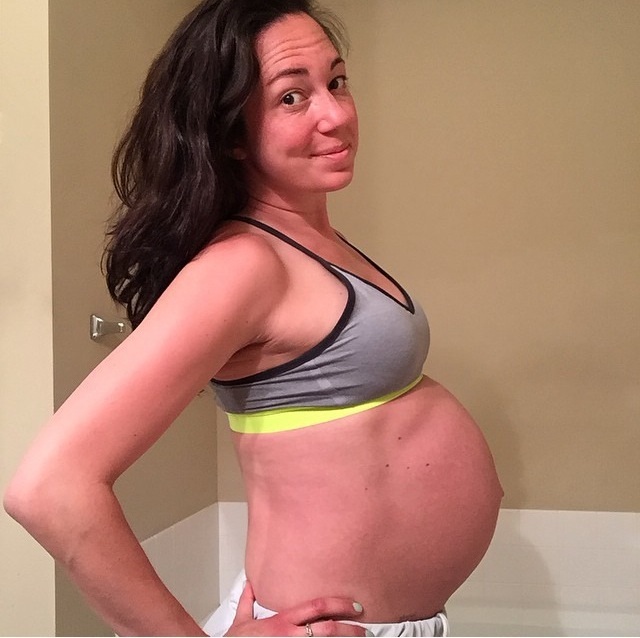 My experience as a pregnant fitness instructor may seem somewhat unique, but I am positive that the underlying tone of these criticisms is something that every pregnant woman experiences in one way or another. If it’s not about being “too fit”, it’s about gaining too much weight (“are you sure it isn’t twins?!”). We critique the pregnant woman who enjoys an occasional glass of wine, or her daily cup of coffee. There are opinions about how long we are planning to take off from work, what our “birth plan” consists of, or whether or not we were “trying” to get pregnant. Why do women feel the need to tear each other down especially during pregnancy? I can’t say that I have an answer to that. Has society created a cookie-cutter image of what pregnancy should be for every woman? That image being we should gain a lot of weight, become highly emotional/irrational, send our partners out for pickles and ice cream at 3 am, and will happily accept the fact that our bodies will never be the same. Lost in those stereotypes is the fact that we are taking 10 months to grow a human life. In truth, pregnancy is one of the greatest responsibilities that some women will ever take on. What’s sad is that society seems to ignore this point, and only focus on some of the superficial aspects of the process. Every woman is very different in how they experience and handle their respective pregnancies. Yet what is common among women is that almost all of us have difficulty with pregnancy at times, and we feel very alone in these struggles. Society’s image of pregnancy tells us that it isn’t normal to experience this type of struggle – and this feeling of isolation can easily breed insecurity in mothers. I think that when we see a woman whose pregnancy is/was different than ours, some of these insecurities surface as snide remarks and criticism. I believe the key to overcoming this problem is for women to be more honest and open with each other about both the joys and insecurities of this experience. By moving past the typical baby-bump questions (“How much weight have you gained?”, “What foods are you craving?”, “Don’t you feel like a beached whale sometimes?”), we can create a more honest and supportive community. Women can ask each other how they are really feeling, praise them for the incredible sacrifice they’re making, and comfort them when they face difficult problems. I know this is all easier said than done, and that change won’t come overnight. Society will still give us its version of the rom-com pregnancy. Princess Kate will still be paraded out in front of cameras in high heels, a face full of professional makeup, and a designer dress, just “10 short hours after giving birth”. (Mothers, am I the only one who wondered what was happening in her underwear at that moment)? Pregnant women will continue to ask themselves “Why is this so much harder for me?” But over time, we can work towards an honest and transparent community where mothers can feel more secure. My time as a pregnant woman allowed me to appreciate the experience that every mother goes through and understand the fact that each woman is unique in their own way. When my daughter Madeline finally came after 41 long weeks, I was ecstatic to hold all nine and a half pounds of her in my arms (hey critics, guess there was enough room for her to grow)! That moment made the past 10 months of a sometimes difficult journey completely worth it. There’s great comfort in knowing all new moms will eventually get to that point. It’s up to us all to make it a little bit easier for them to get there. Here’s Jen looking fabulous at 41 weeks! Love this! I’m currently halfway through my third pregnancy and I definitely have fitness goals for myself. I have ran and worked out for both previous pregnancies and, thankfully haven’t gotten any rude comments or questions yet. This time around I would like to run all the way through pregnancy, if possible, something I haven’t acheived yet. I made it to 30 and 20 weeks. Reguardless of whether or not I can accomplish that goal I also want to using prenatal exercise dvds at least three times a week.